You may remember a few weeks ago, I told you about a date night I had coming up that I was truly looking forward to...the Ruth's Chris Steak House Taste of Napa Wine Dinner. I have been having a hectic few weeks as of late and my husband and I were definitely ready to take a break from it all and relax with a night out that promised both great food and great wine. On Thursday, March 14th, most of the Ruth's Chris Steak Houses around the country hosted a phenomenal night of Napa Valley wines at their establishments. Now, I'll be the first to admit that I don't know that much about the Beringer family or the Napa Valley breed of wines, but I always enjoy a tasty glass of vino and learning more about wine in general. From the moment I took my first sip, I could tell this would be another amazing night at Ruth's Chris! 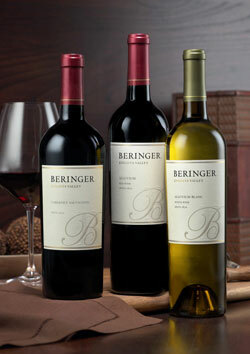 The Beringer Vineyards is a large winery located in St. Helena, California. It was founded in 1876 and holds the title of "oldest continuously operating winery in the Napa Valley". I learned that the Beringer winery was able to survive the period of Prohibition by producing sacramental wine for churches. Now, it is a registered California Historical Landmark and considered to be the birth of wine-based tourism that is a large part of Napa Valley's economy today. To say that Ruth's Chris Steak House knocked one out of the park with their phenomenal Taste of Napa Wine Dinner menu would be an understatement. This menu seemed to be crafted from all of my absolute favorites and I couldn't have enjoyed myself more. The arugula and goat cheese salad was an absolute delight followed closely by the crab bisque. Of course, I was thrilled to experience my absolute favorite menu selection again, the pecan crusted sweet potato casserole. I still haven't made up my mind if this piping hot, melt in your mouth dish should be a side or a dessert, but either way, I just can't get enough of it. The casserole happened to be paired with a sizzling and perfectly cooked filet mignon steak as well as my second favorite wine of the night, the Stags' Leap Winery Napa Valley Cabernet Sauvignon. I'm normally not one who enjoys red wines much, but for this particular vintage, I made an exception. I loved the dry, yet flavorful taste and the rest of the guests at my table seemed to agree as well. Quality wines such as this can definitely stand alone, but Ruth's Chris couldn't have selected a better course to pair it with. A Ruth's Chris Steak House Wine Dinner is so much more than wonderful food and wine though. Every event I've attended has also provided me amazing dinner conversation from interesting people I enjoyed dining with. If you have a Ruth's Chris in your area, be sure to keep an eye on their promotions calendar and attend the next wine dinner they offer. I can promise that you and your date will thoroughly enjoy everything this steak house has to offer! Disclosure: My husband and I attended the Taste of Napa Wine Dinner at Ruth's Chris Steak House free of charge in order to facilitate my review. No other compensation was received. This product review is based on my own personal experiences with this restaurant and is always completely honest and objective.